Info: 1 BR, 1.5 BA Gulf-front Property, 670+/- s.f. 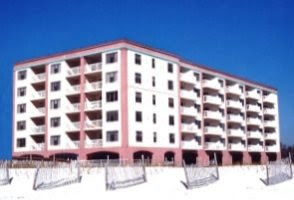 Gulf Shores condo for sale at the Beach Club. This beautiful resort home has amazing views from this – from the private balcony you can see panoramic views of the Gulf of Mexico, the Beach Club pool, the Catalina pool & more. This residence sleeps up to 6 people with 2 full-size bunks, sofa sleeper and master suite. The community amenities include 5 gulf-front pools & hot-tubs, tennis courts, a clubhouse that with an exercise facility, spa, grill, restaurant, indoor/outdoor pools, walking trails, etc., etc. Park your car and never have to leave – ideal real estate investment and/or second home…come see this condo. Beach Club condos in Gulf Shores are situated on the Fort Morgan Peninsula; this popular Resort & Spa resort spans over 86 acres of private beach. The beachfront property rests on the shores of the Gulf of Mexico with the Bon Secour Bay to the north. This community is all-inclusive, with restaurants, spas, tennis courts, exercise rooms, shops, game rooms, etc., there’s never a reason to leave this popular waterfront development.